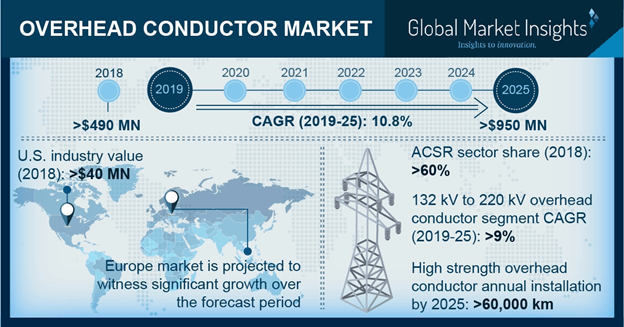 Overhead Conductor Market size will surpass USD 950 million by 2025, as reported in the latest study by Global Market Insights, Inc. Positive regulatory inclination toward the refurbishment & revamping of cross border electricity networks supported by increasing demand for upgradation of existing transmission systems will boost the global market size. Favorable government initiatives in association to positive sectoral reforms adhered by ongoing economic upsurge have further augmented the industry landscape. Aggregate technical & commercial losses (AT&C) coagulated by increasing transmission losses, result in shortage in terms of revenue realization and energy which in turn will nurture the adoption of effective transmission components. > 660 kV units in the current industrial regime, have witnessed considerable growth pertaining to rapid development of ultra-high-tension electrical transmission infrastructure to curtail losses emerging from the long-distance electricity transmission. Efficient long-route transmission, limited utilization of conductor components and lower sagging are key parameters evaluated to affirm rise in the product demand. In addition, shifting inclination for the installation of HVDC power transmission network to cater cross-border energy transition will positively influence the overall overhead conductor market. Overhead conductor market across Europe will observe growth on account of strict energy efficiency measures along with rising share of electricity through renewable sources. Regulators with an objective to develop a sustainable electricity network have been channelizing investments to serve their networks for power generation, distribution and transmission. EU’s policy aims to restructure and invest towards a sustainable power transmission infrastructure to meet renewable energy requirements and serve the growing power demand. High strength (HS) overhead conductor market by 2025, will surpass an annual installation of 60 ‘000 km. Large scale industrial deployment along with viability across utility driven transmission grid will stimulate the industry growth. These units gain installation across diverse transmission infrastructure which comparatively require higher ampacity across the high-scale regional transmission network.